Zurich, Switzerland, Aug. 14, 2013 - ABB, the leading power and automation technology group has delivered the East West Interconnector to EirGrid, the Irish transmission system operator. The 500-megawatt (MW) transmission connection is the highest capacity link of its kind, based on voltage source converter (VSC) technology, to go into commercial operation. The interconnector establishes an important link between the Irish and U.K. grids, enabling cross-border power flows and enhancing grid reliability and security of electricity supplies. The new link also facilitates power trading between the two countries and connects Ireland to the European grid. As Ireland expands its wind power capacity, it can export surplus electricity to the UK, and can import power when required. A 262 km cable system connects Woodland in County Meath, Ireland and Deeside in north Wales. The cables are equipped with extruded polymeric insulation that provides strength and flexibility to endure the severe conditions of the Irish Sea. HVDC Light's 'black start' capability can help restore power quickly in the event of an outage, without the aid of external energy sources. "This is yet another example of the growing role of HVDC transmission technology when enabling key emerging trends like integration of renewables and interconnections" said Brice Koch, head of ABB's Power Systems business. "ABB remains a market leader in this field and we shall continue to push the boundaries of HVDC technology, building on our past legacy." ABB pioneered HVDC technology nearly 60 years ago and has been awarded around 90 HVDC projects representing a total installed capacity of more than 95,000 megawatts (MW) - accounting for about half the global installed base. ABB remains at the forefront of HVDC innovation and is uniquely positioned in the industry with in-house manufacturing capability for power semiconductors, converters and high voltage cables, the key components of HVDC systems. HVDC Light is an evolution of HVDC technology that helps address the needs of long distance underground and subsea transmission. It is increasingly being deployed across a range of applications including integration of renewable energies from land-based and offshore wind farms, mainland power supply to islands and offshore oil and gas platforms, city center in-feeds where space is a major constraint, and interconnections, often across the seas. 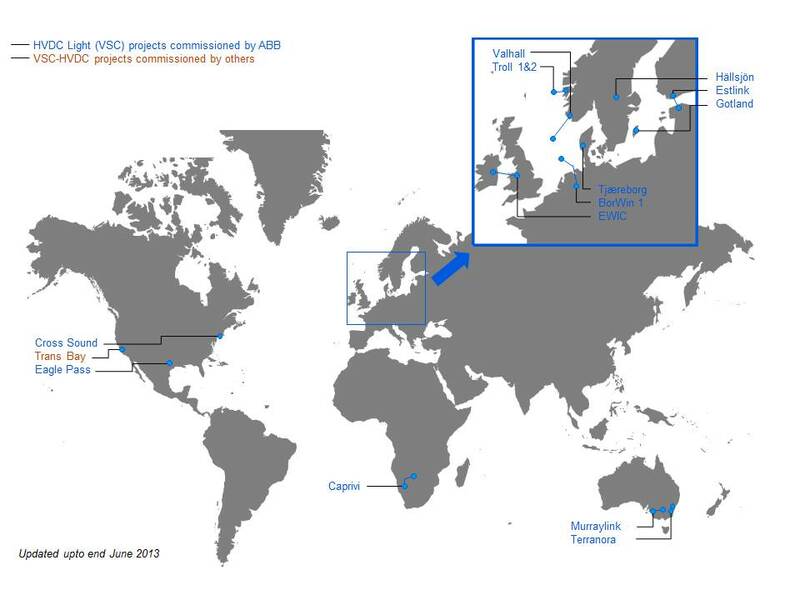 ABB leads the way in this space, and has delivered 13 of the 14 commissioned HVDC links based on VSC technology.